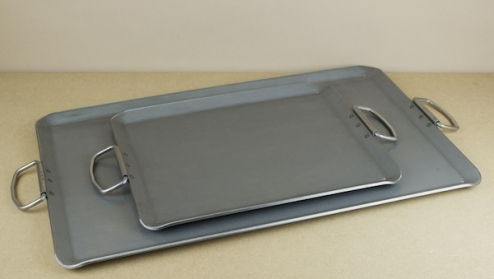 Very heavy, 4mm thick, professional carbon steel hot plates for the direct cooking or searing of foods over any hob, barbecue, or hot coals. Should be seasoned before use. In seasoning the steel bonds to polymerised oil forming a deep brown/black surface that acts as a natural non-stick coating, one that does not peel if over heated, self repairs if scratched, will not release novel chemicals into your food, or poison birds. 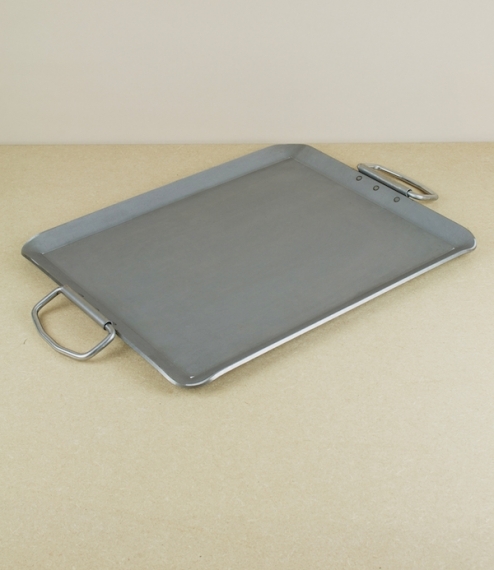 Made in Val-d'Ajol, France by de Buyer, who have been making similar pans in that region since 1830. For a guide to seasoning see our web-log here. In two sizes, the large being approximately 58cm by 35cm, the smaller 27.5cm by 37.5cm.